In my review of The Supreme Court on Trial: How the American Justice System Sacrifices Innocent Defendants (2008), a compelling and provocative new book by Rutgers-Newark Law Professor George C. Thomas III, I explore Thomas’s argument that the adversary system is poorly suited to protecting the innocent, and that the U.S. criminal justice system ought to adopt a number of central features of the French system. ► If the adversary system is at fault, what aspects of it are to blame? ► To what extent are those aspects culturally imbedded, and to what extent are they amenable to reform? ► Alternatively, how much of the problem is attributable to deeply rooted cross-cultural factors that transcend national boundaries? Such factors might include cultural and social alignments between judges and prosecutors, institutional pressures toward loyalty and cooperation, and racial and ethnic prejudice. ► First, there is the problem, endemic to comparative analysis, of what versions of the French and U.S. systems are being compared. Some central features of the French system Thomas describes are in flux or have changed considerably. Most important, Thomas describes a French system in which the investigative magistrate plays a central role in the truth-seeking process. As IntLawGrrls contributors Jacqueline Ross and Diane Marie Amann have described in posts here and here, the role of the investigative magistrate has diminished dramatically. In addition, as Ross and Warwick Law Professor Jacqueline Hodgson, have described, the investigative magistrate in practice does not appear to be as neutral and independent as his official description suggests. 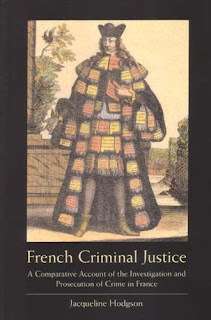 (See Jacqueline Hodgson, French Criminal Justice: A Comparative Account of the Investigation and Prosecution of Crime in France (2005) (right), and Jacqueline Ross, "Review of Hodgson," 55 Am. J. Comp. L. 367 (2007).) This problem is exacerbated by the weak role of the defense attorney (a role that is justified by the strong and independent role of the investigative magistrate). ► Second, there is the question of how certain attributes of the French system could be adopted in the United States. For example, how could the investigative magistrate role, even in its “ideal” form, be implemented in the United States, with its deeply rooted culture of decentralized judicial selection, and given the current reality of widespread plea-bargaining? Interestingly, the most intriguing reform Thomas proposes is inspired by the British system: the proposal that advocates serve, from time to time, as both prosecutors and defense attorneys. The bottom line: the book is highly recommended, and it illustrates the need for additional comparative study about what causes wrongful convictions and how to prevent them.